Rosalie Sterner is already impressive, concurrently pursuing her M.D. and Ph.D. degrees through Mayo Clinic College of Medicine and Science. However, recently she made additional waves, as the lone medical student to receive the 2018 Outstanding Abstract Achievement Award from the American Society of Hematology. Sterner received this award and presented her work on development of safer and more effective strategies for chimeric antigen receptor (CAR)-T cell therapies at the ASH annual meeting in December in San Diego. The Outstanding Abstract Achievement Award recognizes meritorious science and supports early-career investigators by honoring the trainee with the highest-scoring abstract in five categories: undergraduate student, medical student, graduate student, resident physician, and postdoctoral fellow. 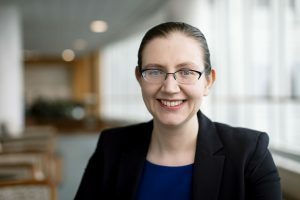 Through Mayo’s Medical Scientist Training Program, Sterner completed her doctoral thesis in immunology at Mayo Clinic Graduate School of Biomedical Sciences in 2018 and is now in her third year at Mayo Clinic Alix School of Medicine. Sterner is part of a team of Mayo Clinic researchers from the Department of Immunology, Division of Hematology, T-Cell Engineering Laboratory, and Department of Molecular Pharmacology & Experimental Therapeutics who have developed a strategy to reduce toxicity in CAR-T cell therapy. An immune-system reaction associated with CAR-T cell therapy can produce two potentially deadly complications. The team led by Saad Kenderian, M.B., Ch.B., a Mayo Clinic hematologist, has found solutions to help patients who experience these toxicities. Read related news release. “We’re very excited by the results [of the research]. This strategy definitely has a lot of potential and could help a lot of people,” Sterner says. She became involved in the toxicity project while completing her thesis in the cell-signaling lab of Karen Hedin, Ph.D., who collaborated on the project with Dr. Kenderian. Now the research team is designing a phase II clinical trial for the use of lenzilumab to prevent CAR-T toxicities in patients with diffuse large B cell lymphoma. If the trial results are consistent with earlier findings, the therapy could become a standard of care during CAR-T cell therapy at Mayo Clinic. This research falls under the category of immunology – the science in which researchers study the fundamental mechanisms that cause and regulate inflammation and immune responsiveness. She’s already advancing the science and has not even finished medical school. More work to improve outcomes and make the health care experience better for patients is undoubtedly in her future. Stay tuned. 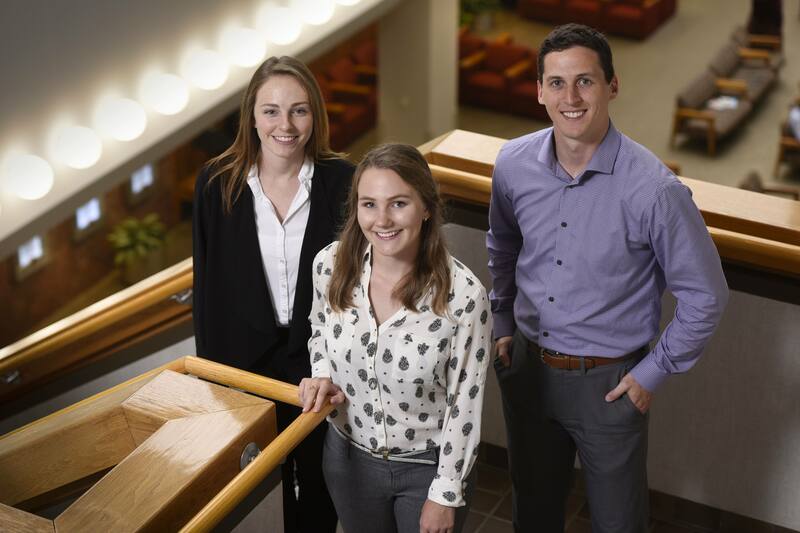 From left: Emma Goddery, Paige Arneson, and Christopher Paradise, comprise the inaugural cohort of Ph.D. students in Mayo Clinic’s Regenerative Sciences Training Program.